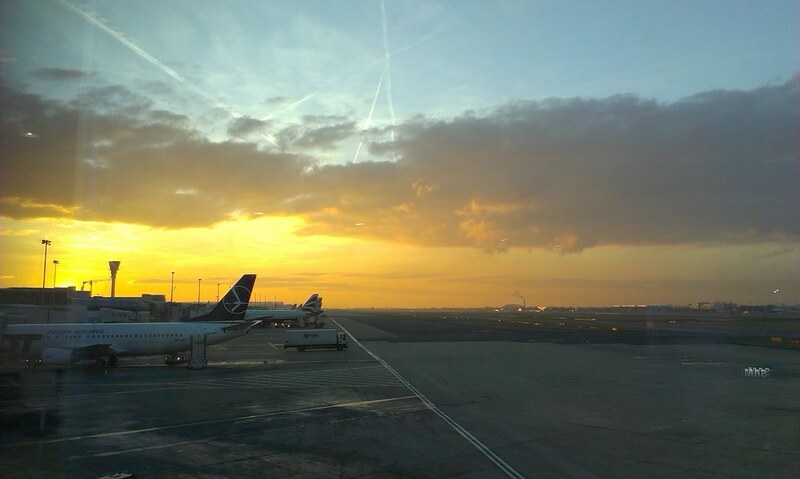 Heathrow airport – Neil Baldwin's blog : Warning contains walking, technology, photography, holidays. For reasons I won’t go into I find myself at Heathrow airport terminal 1 late Sunday afternoon waiting for a flight to Belfast, so as is traditional I thought I world share my thoughts worth you, in a compare and contrast with the experience I am used to from using Luton airport, sorry that’s London (Luton) airport. The journey to Heathrow involves a slightly longer drive but by motorway, compared to a country route, but at the time of day that I would normally travel I am not at the that it would make much of a difference. I for of the M25 at junction 14 because my satnav told me to but it was a bit tricky funding the car park from that direction, next time I will take the M4 spur route as the route is simpler. There were plenty ofs parking spaces and the bus pick up was prompt. The cost to park was very much more costly than Luton but I could not get in the parkway hotel parking as they were booked out. Next step security it seemed packed but they run a very slick operation and the queues just move constantly forward and in no time I was scanned and sent on my way. At Luton I would have done priority lane through security, so I guess they are both different but I would not choose one over the other. The security is for more sophisticated at LHR as security take a photo then when your gate is called they take you to another security section before you are allowed towards the departure gate and they check you against the photo they took earlier. Strangely they had not up to that point actually checked my ID but having said that would it have made any difference if they had checked who I was. I guess the airline will check my identity checker as I board the plane. Thinking about it that is also the car at Luton, it is only Easyjet who check that you are who you say you are, all security want to know is do you have a valid boarding card. Although I missed the flight being called and did my best to wander and amble along to the gate to kill time I was one of the first to reach the gate area. They were free newpapers, mail and independent but they had run out of independent then I noticed that the dispenser had a display copy under plastic on the front, result I had a paper to read on the plane. And need it I did. Once on board and seated the captain explained the 15 minute delay because the deck was delayed from terminal 5. During the announcement he also mentioned that traffic control had informed him of an indeterminate delay due to an event. 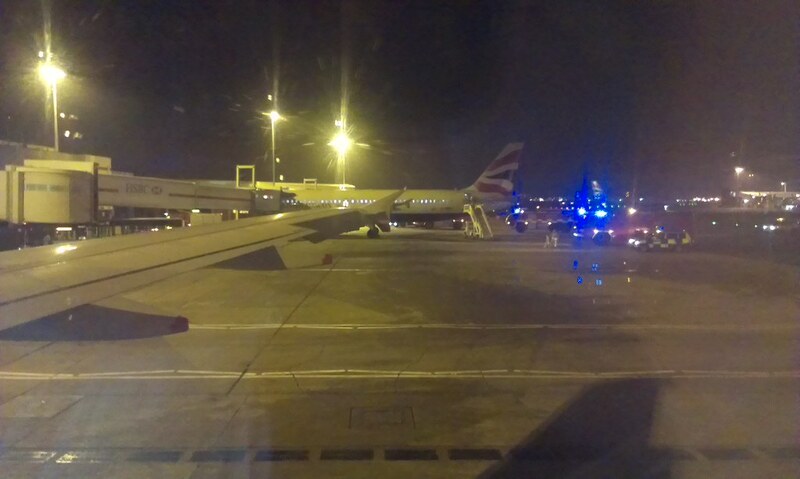 10 minutes later the plane next to us was surrounded by fire engines with blue lights flashing. The passengers were disembarked on to a coach and firemen went the steps. I saw no smoke and we eventually taxied off the stands a bit late then the plane seemed to take ages to find its place in the queue to take off. Finally we took off about an hour and twenty minutes late, not very encouraging. One of the benefits of flying BA is that you get complimentary drinks, I had a Tiger beer and a packet of crisps, although the packet of crisps only had about 8 crisps in it as it was a very small packet. The cabin staff really had their work for out serving up drinks then clearing them away, they literally serve up the drinks from two trolleys with two staff on each trolley working flat out, then start clearing up straight away. It is a good job they serve small drinks and crisps we would not have been able to finish them otherwise. There was no queue at Avis hire car, so I grabbed the keys to a black Audi A3 and hit the road. Apart from some confusing junctions in the centre of Belfast my journey is all on the motorway till I get to the other end, and by 21:00 I was booked into my room at the hotel. It was too late to eat so I went to the bar and had a quick bottle of beer and a packet of peanuts. I slept well (unusual for me in a strange bed) and was up and having breakfast by 07:30, then it was off to work for a series of meetings. The most important being catching up with colleagues who are working on the project to merge 3 different Sage Line 500 databases, into one trading database. Sometimes it really helps to meet up with people in person things seem to actually get done, there and then rather than agreeing to do something after a phone call has finished. Back at the hotel I had the cauliflower, chickpea, and spinach curry with pilau rice, then retired to my room to watch Eastenders then got to sleep early for another day at the office. I left the office at 15:30 to get the 18:05 to Heathrow. The traffic in Belfast was quite heavy so compared to getting to International it was more tedious, but this must be weighted against the frequency of the flights. BA and Aer Lingus fly to Heathrow from City airport so again there are pro and cons. On the way I needed to fill the hire car the easiest way to do that is to go past the airport to the local Sainsbury’s or Tesco then double back it probably adds about 10 minutes to the journey. I grabbed a cheese and tomato toastie from the Lavazza Expression coffee/food establishment and settled in for a 30 minute wait for the flight to be called. We taxied out to the runway then sat around for a while the captain announced that the washout was for to them waiting for a download from head office regarding those balance and trim, bit eventually we took off. As we approached London the captain further announced that we had mace good time bit for top traffic we would have to circle for a while but expected us to land at 19:25 which I believe was on time, with a fair wind I would be home by 20:30 which is a reasonable time given that I was travelling. Tomorrow I would be back again at terminal 1 to pick up a colleague flying in to join me visiting a potential supplier!